Coaching can be used to develop and support new behaviours and techniques in a wide range of workplace situations. Yet the area where I feel it has the largest measurable impact is when it is used to provide support and challenge in times of change. This change can be large scale; mergers, buyouts and redundancies all impact on all the people in an organisations to some extent, even when their jobs are secure. Or it can be change that affects just one person; a team restructure resulting in a change in role or responsibilities, a promotion, or a change in circumstances, such as returning from maternity leave or pending retirement. 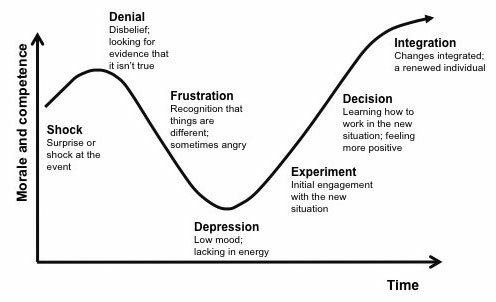 All of these issues will mean change of some sort for the people involved, and if we consider the Kubler Ross Change Curve (below), it is widely accepted that change is disruptive, and sometimes unpleasant, for those it effects. So how does coaching help? Coaching can provide an outlet for people’s concerns, emotions and uncertainty at all stages of the change curve, so that they can better understand what the changes they face mean for them and what they may need to do to adjust. - Two clients were moving from senior manager to director level roles. They had both been identified as good internal candidates who were not quite ‘ready’ for their roles. The coaching helped them to focus on their areas for development which were around demonstrating leadership skills and they were able identify actions and activities which enabled them to step up into their new roles. Both are now in even more senior roles! - After returning from a much-needed holiday, one client found that their direct line manager, a Director, had left the organisation. They knew that they didn’t want the role themselves but that they would be expected to fulfill the role on an interim basis, whilst recruitment took place. Coaching helped them to find ways to manage and work with this increase in expectations and then to hand over happily to the new Director on appointment. - Another client found themselves effectively demoted as a result of their company being bought by a larger one. The buyer already had someone in their role, so they were restructured into a management (rather than Director) position. Coaching helped them to consider what the long term career options may be (with the support of her business, even if this meant moving on) whilst also managing the day to day tasks of what was considered a very important role. By the end of the coaching the client had a clear plan for the future, which has been followed ever since, and they are still with the same business! - The final example that springs to mind is a client who had found themselves restructured into a new team and a new role, which mean the loss of management responsibilities. A redundancy package was offered but wasn’t a viable option. The coaching helped the client to identify how they could make the new role work for them and to better fit with their personal circumstances than the previous role had. The client left the coaching process feeling much more at ease with the changes that were afoot. This results in changes, and change programmes, that move quicker, have greater impact and are longer lasting. So what’s changing for you and your people and how can coaching help?